The lists below will help you find your nearest Siamese cat rescue centers. These centers are generally run by individuals or small groups of people who are passionate about the breed and in many cases have dedicated their time and their own money to rescuing and caring for pedigree cats. 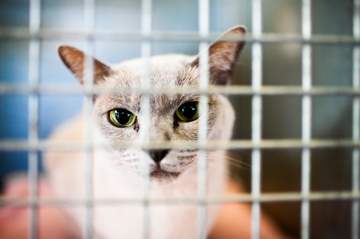 They may be breeders or ex-breeders who have the cattery facilities to offer cats space in their own homes, or otherwise cats may be fostered with volunteers until permanent homes can be found for them. So if you're thinking about adopting a cat, why not contact your nearest center? ... know that taking in an abandoned cat may not be for everyone. It's not always plain sailing. Many cats taken into adoption centers come with 'baggage' and behavioral problems. They may have been harmed or mistreated in the past and may not be too trusting of humans, and it may take time (in some cases, a lot of time) and patience before they settle in and become loving family pets again. Before contacting one of the centers below, take a look at my Siamese Cat Adoption page for a full list of things to think about. And if you'd like to know what adopting a cat can be like, why not take a look at Siamese Cat Adoption Stories? I've put together a list of all the rescue centers I can find around the world. You'll find this list below. I'm not associated with any of these groups, but if you have any problems contacting any of the centers listed, do please let me know so that I can keep the details up to date. ... and you can't adopt it yourself and don't know what to do with it, rather than handing it in to a general animal pound, why not try contacting your nearest center for advice on what to do next? Do you run a Siamese rescue center? If you do, and it isn't listed here and you would like to be included, please contact me by using the form on my 'Contact Us' page. Based in the South of England and East Anglia, the SCCWT is a charity rescue and re-homing service. The SCCWT generally have adult cats in need of permanent, loving homes. They do not have kittens. Linked to the SCCWT, based in Sheffield. Sometimes has cats in need of a new home. Each of the centers is an individual charity offering advice, information and re-homing. They are always, always grateful for donations and practical support. Siri Zwemke, who started the Siamese Cat Rescue Center in Virginia (from which all the others sprang) has written an honest, funny and sometimes heartbreaking book, Rescue Meez, about her experiences. Available on Amazon, you'll find a link to the book below and all purchases (and reviews) would be a great help to the rescue effort. The following Siamese cat rescue centers are listed alphabetically by State. Based in Pennsylvania, all cats are homed in foster homes in the States above. Also re-home Orientals, Cornish Rex, Snowshoes and other breeds. Purrs Abound Siamese Rescue of Michigan, Inc.
Have purebred pedigree cats of all kinds. The only Siamese Rescue I can find in Australia - this is their Facebook page. Please let me know if you know of any others! Do cats need baths? How do you bath a cat?